Acoustic Energy 3 Series 5.1 review | What Hi-Fi? We’re over the moon to welcome back Acoustic Energy’s 301 standmounts only months after they left our test rooms with an admirable five stars. This time though, they’re joined by a 307 centre speaker (£350), 308 subwoofer (£800) and a pair of 305 floorstanders (£1000). Together, the ensemble is better known as the 3-Series 5.1 package, and will save you £150 of the separates’ sum if bought as one. The 3-Series marked the start of a new era for Acoustic Energy in 2012, bringing contemporary design to its 25-year-old heritage technology. So hats off to the company. Having journeyed down the path to modernization it’s come out the other end with an attractive line-up. Stylish yet simple, the package’s six speakers have sturdy, well-built cabinets in-keeping with the price. The glossy piano black or white finishes look and feel nicely polished. Things are kept clean at the front, with nuts and bolts transfixed through the back panel. The use of magnetic grilles ensures the cabinets have an immaculate, hole-free frontage too. When we say hole-free, we mean absent of ugly fascia holes, of course. Because at the base of the five stereo speakers are front slot ports, aimed to control air turbulence and allow for flexible placement against a back wall. Higher up the baffles you’ll find the 11cm spun-aluminium cone, hard-anodized for more rigidity and improved damping. A 28mm fabric dome tweeter is consistent across the range too. 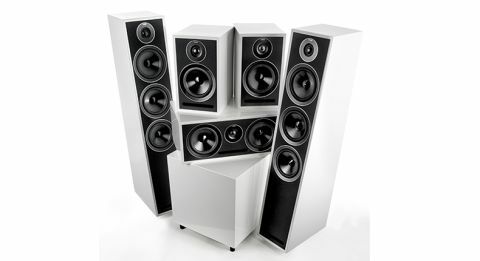 The 305 floorstanders up front are three-way speakers, using twinned bass drivers. Their sloped baffle (resonant in the company’s latest entry-level 1-Series tower too) is designed to better integrate the frequencies. Around the back are single speaker terminals, so there’s no bi-wiring – and that applies to the whole range. Taking centre stage between the towers, the 307 is a nicely compact speaker with twin drivers sandwiching the tweeter. The 301s are your backseat drivers. They’re typical-size standmounters so they don’t have the practical slim build or the handy wall-mounting potential as some do. While the guidelines for placing your subwoofer are less clear, it should sit somewhere along the frontline for optimal co-operation with the speakers. The 308 sealed sub houses a down-firing 30cm pulp-fibre driver and is powered by a 500w amplifier. Jump straight in with the pre-title train pursuit on Skyfall Blu-ray and it’s immediately engaging. The pulsating soundtrack is atmospheric and absorbing, and there’s a realistic sound of suction as train passes underneath tunnels. Punches are, well, punchy, and the majority of combat sound effects at the forefront are all in fine feather. Ample detail means subtleties are paid heed too, so the milieu chugging noise of the train is never lost. The sub is a gutsy performer – the package’s backbone if you like. Sealed subwoofers often trade bass quantity for flexible positioning and improved accuracy, but this doesn’t feel lacking in any way. There’s sufficient rumble when Bond plunges into water and explosions sound as devastating as they look on-screen. It’s forceful enough to warrant praise a number of times during our testing, but not distractingly so. AE has worked hard to voice-match the front three performers, and the results are on the money. Articulate, clear and direct, dialogue blends in well and sounds natural in routine scenes. It has no trouble pulling out the trite mid-shoot-out clichés (that we all know and love) either. That’s not the only evidence of good integration, though. Crossfire to a Bond movie is like a moth to a flame, and the package accurately traces every shot. Tight unity across the frontline and between the front and back eliminate any holes in the soundfield. The whirring of helicopter propellers sweeps around the room smoothly. The rear standmounts’ conventional design means they don’t quite achieve the same wrap-around effect as some dedicated rivals do, though. But lacklustre dynamics is what really taint this package. While they aren’t dire, they don’t fulfil the potential in build-ups to climaxes – a critical ingredient of action movies like Skyfall – and miss a bit of pizzazz as a result. Try our luck with a standard CD - in this case Macklemore & Lewis’ The Heist album - and excitement still skimps due to par dynamics. Nevertheless, tonal balance makes them very listenable with music, and precision and stereo imaging are both sure enough. It has the might and main over bass lines, and eloquently spews out Macklemore’s raps. It’s tough at the top and one flaw could cost you a star. Here it does and the downfall is dynamics. We’re still impressed, though. This is the first package we’ve heard from AE in a while, and it’s a real good’un. If you want an elegant, well-built surround sound with clear-cut precision and authoritative bass, this is definitely worth consideration.